In Form, we look at the association between the basic elementary shapes and how its mixture and composition can have an adverse symbolic representation to the Feng Shui of the building. Take for example an East-facing-West-sitting building as illustrated below. By sitting West, the building is typified as a Metal building. Based on the 5 elemental shapes, we identify the basic shapes beneficial for a Metal building to be Square and Circle. The Square is the most basic form representing the element of Earth, while the Circle represents the element of Metal. Through the 5 basic shapes you can come out with any form you desire. However, you must acknowledge the thought process in combining these basic shapes. In the example, the two basic forms are integrated by attaching the half-circles to the overall square (earth) base. In doing so, it allows the circular forms to accentuate the overall massing model, offering pristine viewing portals for each façade, thus giving a unique interior motif for each sector. The other aspect is the planning of the forms. You need a design that integrates the concept of building shape massing with a carefully planned space concept. The Function defines how we segregate areas within the home to service public and private spaces. In the example, the invisible division of needs is located at the central living core. All spaces to the right are reserved for a private bedroom, study and living area, while the central space serves as a central collection zone. Areas to the left are fully dedicated for the public servicing of the home, where it locates the dining, kitchen and service quarters. The arrangement of the functional spaces leads precedent to how we arrange the Flow or Feng Shui of the space. The feng shui of any space relates directly to not only how we plan the building or house to its specific flying stars and direction, but also to how the plan allows the expression of a gentle flow through the space. 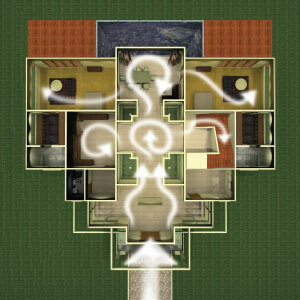 In the previous example, the layout affords a large open central sector which expands the emphasis of the central grid. This allows the energies entering the home to collect and circulate within this zone before seeping to the rest of the building. Note that the key feature is the division of flow between the left and right sides through a central zone. One key aspect of such central zones is that for all Period 8 homes, the central zone is vital to the feng shui of any home as this sector is reserved for the locations of your water or mountain star #8, otherwise referred to as the wealth and relationship stars for the Period of 8. The next example looks at a centralized flow of space. Again the central zone is highlighted through the location of the entrance, the collection zone at the heart of the home and the final living area at the rear. This allows the division of function within the home to be determined by this central core, where all private spaces are placed at the back and all service and public zones at the front. One of the key factors in creating the Feng Shui Flow is the introduction of a few design factors. One is the breakup of the direct line of sight from the front to the back. While the central zone is fully utilized in the key functions, you do not want the energy entering the home to flow directly through. In this case, a separation screen is used to allow the energy to collect in the front lobby before moving to the central zone for further circulation, before moving to the rest of the house. The central zone becomes a very important area of the home as this is where the energy circulates before moving to the service areas, the living halls and the rooms above. 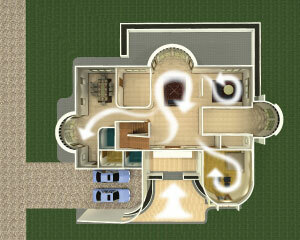 The other aspect of this design is to allow the house to maintain as much depth as possible. 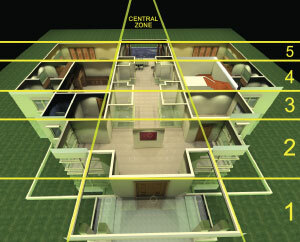 Depth in this case is determined by the number of rooms or sectors. 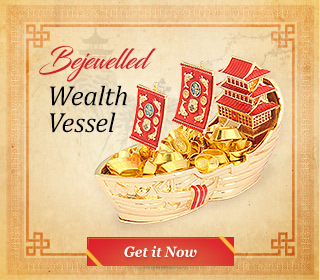 In this case, the house allows for a depth of 5 levels, which is beneficial for the occupants as it symbolizes luck stretching for many generations to come. By incorporating these three aspects of design, you can start to see how design affects the way we live and how important it is in our lives. While the Form and Function of the building illustrates the look and feel, the Feng Shui Flow is what ties it all together. The Flow relates to our internal perception of space, the experience of space and the emotions we evoke. Through the Feng Shui Flow, we can design a space that caters to our emotional needs and how we as people can live in a setting that puts a sense of calm into our lives – this is the secret to a happy home. Previous articleMaking Decisions Before You Renovate – Is A Larger House Always Better?